Well, thanks to follower, friend and critique buddy Janet Johnson, I have a blogging award to pass on. According to Janet, the idea is “to share three under-the-radar blogs that I love and then visit the blogs everyone else mentions,” that is, the blogs of your visitors. Well, I am definitely under-the-radar and nichey. LOL There’s no way around that. I’m not sure you can call Catwood’s blog “under-the-radar,” but she’s rebuilding her site. If you’ve ever done that, you’ll know you lose a whole bunch of followers, so I thought I’d post her link. Jeannie Lin’s blog is far from under-the-radar, but it is still related to my topic and therefore nichey. Head over there today. She’s got a great post on one of the differences between Western and Asian lit. Yay for paying it forward! Thanks for sharing. This was my first blogfest. And I met lots of new bloggers. Wow, love this idea of paying it forward. Such coolness. Again, thank you my friend. Thanks for the links, Victoria. Will check them out. I hope you enjoy them, Rachna! Argh. Thanks for the recipes, Rashda and you're welcome, Rachna! LOL Trying to do more than one response at a time. It just doesn't work…. Pleased to meet you, Victoria. I'm familiar with one of your three under-the-radar blogs, and the other two sound very interesting. Thanks for visiting me. This was a wonderful blogfest, which I'm catching up with. I didn't participate, though. I will next time. I'll check out your links. Thanks, Medeia! Hope you're having a wonderful day. 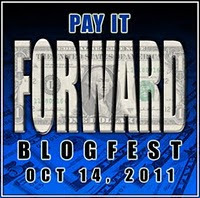 Even though I didn't participate, I thought this was one of the best ideas for a blogfest ever. I've discovered some great new blogs and looking forward to checking out your links! Thank you so much for the beautiful award, Victoria! I'm always on the look out for other great blogs to follow, which is half the fun of getting a little blog bling! Thanks for being the other half of my Mutual Admiration Club…also the Sisterhood of the Chuckling Snails, I believe you called it once upon a time. Hugs to you for being such a wonderful person and a great cyber friend. LOL! I'd forgotten about the Sisterhood! OMG, I need to write down some of the craziness. That's the bad thing about insanity. You frequently don't remember the good parts! Thanks for that. 😀 You've been a wonderful friend. God Bless! Yes, she is. She's been a long term writing friend and critique buddy for I don't know how long.